If you’d have to guess what the most popular services performed at the salon are, what would you choose? Maybe a blowout or a simple trim, right? Those may be common, but did you know that hair straightening is actually one of the most common services performed out there? If you have curly hair, then this may not come as such a shock to you. While hair straightening is a big money-maker, due to the repeat customers out there, you need to feel assured that you’re using the best product for your hair. Relaxing your hair can be very damaging performed time after time, even if you’re going to a professional. That’s why it’s so important to select only the best hair relaxers for you and your hair’s needs. While the above is an overview, you may have an idea of which one may work best for you. If not, or if you’d just like some more clarification, then keep on scrolling! We have detailed reviews of each product and are sure that they can answer any of the questions and concerns you may have. If you’ve used hair straighteners or relaxers before, then you probably already know that Mizani is one of the best brands on the market today for high-quality, effective products. 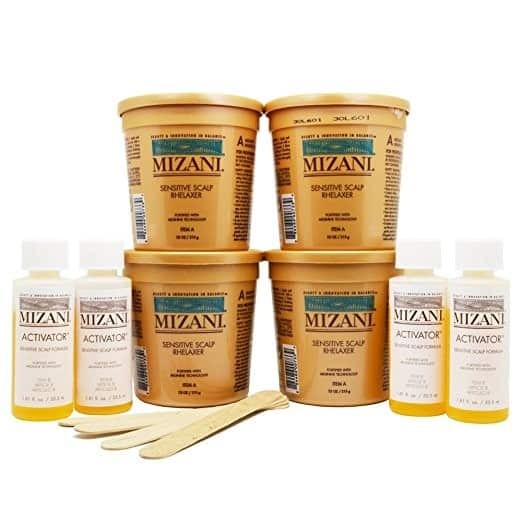 The Mizani Hair Relaxer Unisex Kit is awesome because you get a large amount of product consisting of four 7.5 ounces sensitive scalp relaxer base, four 2 ounce sensitive scalp activators, as well as four wooden spatulas (one for each use). If you have really sensitive skin or dermatitis and can’t normally use hair relaxers, you’re going to love Mizani’s kit. This one has worked wonders with those with sensitive skin, and won’t burn or make you have to rinse out after just a few minutes. It’s gentle and will leave your hair in a healthy condition. We will say that the one thing we weren’t 100% pleased with, was the fact that it’s a bit more difficult or tedious as far as the application process goes. With that being said, we’re going to go ahead and list off the instructions, so you know what you’ll have to do every time you apply this chemical hair straightener. First, you must check the state of both your hair and your scalp. If you color or straighten your hair a lot, and your hair is already damaged or brittle, we do not recommend using this product. In addition, if you have any sores, scratches, or any kind of irritation on your scalp, do not use this product. Avoid intense brushing, combing, or pulling your hair. Make sure to wear protective gloves when applying the product. Before you apply the product to your entire head, we can’t stress enough the importance of conducting a strand test using the relaxer application instructions which are included. If your scalp and hair are in good or great condition, then you can proceed. Mix by pouring one conditioner portion of the butter blend sensitive scalp activator into the jar with the butter blend sensitive scalp relaxer base (similar to the hair dying process if you’ve done that at home before). Grab the mixing spatula and stir together until the two products become one, are smooth, without any kinds of lumps or bumps. After everything looks uniform, let it sit for five minutes. If your hair is processed or colored, then you should leave it on for 10-15 minutes. If It’s fine, 18 minutes, and if it’s normal to thick, 18-20 minutes. Apply and spread the Creme Normalizing Conditioner to all of your hair, and cover your hair with a plastic cap. Make sure to never apply heat! Leave it in for ten minutes, and rinse thoroughly. 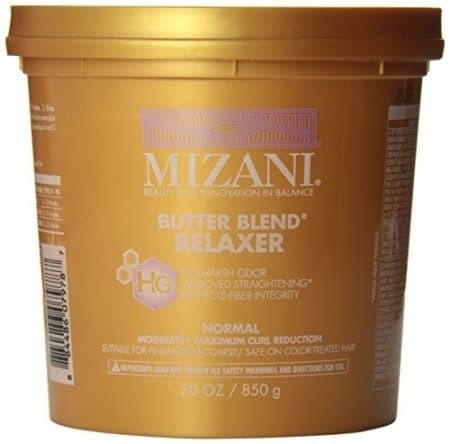 Once you’re done, apply the butter blend sensitive scalp balance hair bath to your locks. Lather and rinse completely with warm water (not hot). Then, go ahead and repeat. 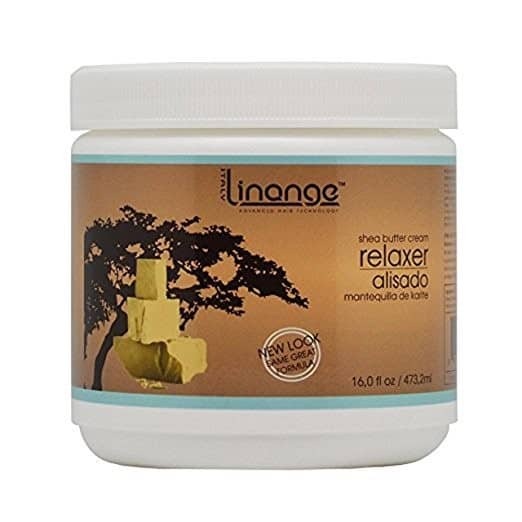 Alter Ego’s Linange Shea Butter Relaxer is one of the best if you want your hair to come out sleek, shiny, and straight! Straight off the bat, we’re going to say that we weren’t a fan of the smell. It is very chemically-smelling, also this is somewhat normal for relaxers. If you have coarse or thick hair and are having trouble finding a relaxer that really suits your needs, then check this one out, as well! We found that while we had to use more product to get the same or similar results with other products, this one we actually had some product left over, which was cool! We really liked the fact that after you’re finished using the product, your scalp Isn’t all dry and irritated afterward, like what happens with some other products. You do need to use the conditioning neutralizer and to fully rinse the relaxer out with a lot of warm water. We found it best to use the conditioning neutralizer at least a few times, and finish with a mild shampoo. 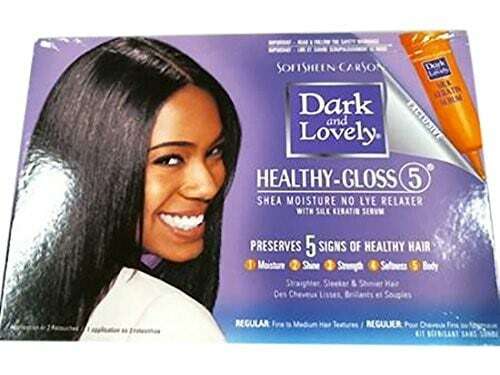 Dark and Lovely by Softsheen Carson is probably the most “famous” and best relaxer for black hair out there, today. Over and over again, it’s been proven to be one of the best and is renowned for its multi-step process that makes sure hair is protected and comes out looking healthy, silky, and straight. The Healthy Gloss 5 they have going on is supposed to be the “next generation in relaxing”. They have a unique system in place, with a silk keratin serum, a moisture conditioner, a moisture hair crème, shea butter conditioning relaxer crème, and crème activator. While that may seem like a lot, they each have their own purpose. They together, provide moisture, shine, strength, softness, and body. The silk keratin serum instantly provides strength and protection, giving that silky-smooth finish. The moisture conditioner recharges hair with five times more hydration, and the moisture hair crème also replenishes hair with shine and softness. Ideally, this is for fine-to-regular hair types. What we really didn’t like about it, was that it didn’t work very well for thick/coarse-haired women as well. If you take a look at the video below, you’ll see an example of this. The woman used the product but still came out with quite curly/wavy hair. Another slight issue we had with this home hair relaxer, was the fact that it did have so many steps to it, and all must be followed properly. Long story short, it got quite tedious. In our experience, we have not found any no-lye relaxer that works as well as the Hawaiian Silky. We aren’t the only ones who are incredibly impressed with this product (check the video above). Haven’t heard of lye relaxers or no-lye relaxers before? Here’s a short summary. Lye relaxers feature a main active ingredient of sodium hydroxide. The pH level in lye relaxers are around 12-14, and for no-lye, around 9-11. Now, our hair should typically be around 4-5. So, does this mean lye relaxers are bad? Not necessarily, as many obviously work well. However, know that a lye relaxer functions by breaking down the hair’s bonds rapidly. The good part of that is that you see less scalp irritation, as it works so quickly. No-lye relaxers like the Hawaiian Silky features a main active ingredient of calcium hydroxide or guanidine hydroxide. No-lye relaxers often create even dryer hair because of calcium build-up, so we don’t recommend these for sensitive scalps. This can easily be combatted by using a clarifying shampoo and/or deep conditioner regularly. 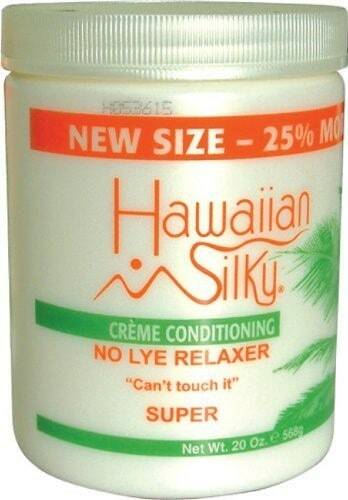 One thing the Hawaiian Silky is really skilled at is creating a silky smooth finish while maintaining moisturized hair. We recommend this product for fine hair, although it can be used with thicker hair, too. Combining the benefit of avocados along with Tea Tree Oil, it works to shield and fortify your hair. Avocados contain amino acids, proteins, and a good portion of vitamins e, d, and a, which all work to strengthen your hair. This best-rated hair relaxer doesn’t just moisturize, but also helps detangle hair and straightens natural curls very well (ideally for thinner hair). The Wella Wellastrate Straight Cream Intense is one of the best hair relaxers for caucasian hair, but is also one of the best relaxers for black hair! Wellastrate is a powerful, yet efficient and reliable straightener which thanks to its new cationic formula base, makes sure to keep the best structural balance as possible. It is unique, which may keep people a little wary about trying it, but we can assure you, it works wonderfully! No matter if you have thin, regular, or thick hair, the Intense Straight Cream works to maintain moisture while creating supple, straight, and manageable hair. The Hydro Safe Complex increases hair’s own ability to hold moisture, while the moisture formed like this makes sure the hair doesn’t dry out. If you have sensitive skin, not to worry! The best hair relaxer has been tested for skin compatibility and makes sure you won’t experience redness or itching like you do with other products. Creating an optimal balance and preservation of structure makes sure your hair is in its best state; not just looking like it is. The package includes just one tube of the straightening cream, as well as the neutralizing emulsion. We do recommend the starter cream, intermediate spray, as well as the finishing cream to see best results. What we didn’t like, was that the package does not come with these items, so it seems a bit incomplete. When it comes to purchasing the best hair straightener, you already know you need to pick the one that works well for your individual hair type and health. If you’ve never purchased or used one before, this may seem a bit intimidating, as there are so many different types out there! Hair straighteners are some powerful products, and you don’t want to damage or mess up your hair in any way. That’s why we’ve created this guide here below for you so that you’re not left in the dark or left with a product you don’t like! We touched on this earlier in the article, but we really wanted to emphasize this step in the decision-making process with your best hair relaxer. No-lye has a lot of benefits, including the fact that it is lower on the pH scale; closer to the pH our hair is supposed to be at. However, it can cause a calcium build-up, which creates a dry scalp and/or hair. While this can be solved by using a clarifying shampoo and/or deep conditioner, you may feel like you don’t want to purchase excess products on top of the hair relaxer. Lye is higher on the pH scale but is preferred by many with sensitive skin/scalps, due to the fact that this chemical works faster. It works faster by breaking down the bonds in the hair strands, meaning that you get to wash the product out faster, thus decreasing the chances of a reaction to the product. Now, you have probably noticed by now that some of the packages/kits contain more products than others. We personally prefer those which contain the actual relaxer and some kind of neutralizer and conditioner. You cannot use your regular shampoo to stop the relaxing process. If you do, you’re going to see extreme breakage and hair fall in the next few days or weeks, and that isn’t good for anybody. The neutralizer is what actually stops the process; as long as the process is going, your hair is being eaten through. If you have long or very thick hair, also keep this in mind before you begin, as some products include neutralizer, but only a small bottle suitable for short hair. Conditioner should also be included, and never skipped. Relaxing hair is rough on our tresses, and they must be restored in some way, to keep them looking and feeling their best. Also, make sure to have enough conditioner before you start the process on your hair. If you’ve never done this before, or have but didn’t like the results, then maybe you missed a few critical tips. Here they are, below! If you decide at the last minute you want to touch up, then avoid washing for about a week to 10 days before applying any kind of chemicals on your hair. Also, try to be kind to your scalp and hair; avoiding scratching it or being rough with it in any way. This is very important, as mentioned above with the conditioner and neutralizer. You don’t want to have to make a run to the store to get one after it’s already been too much time with the hair relaxer on your hair! Always do this; even if you’ve been relaxing your hair for years. This is particularly important if it’s your first time relaxing your hair or using a new product on it. Keep in mind that we can also develop allergies at any time; even for products, we’ve used for years. Trust us – just take the extra few minutes to do it. We can’t stress this enough! The directions that come along with the product are there for a good purpose. Although each process may seem the same to you, it can still be risky, so just make sure to read through them thoroughly to avoid any serious issues. For the ideal results, don’t just slap it on your entire head at once. Work in small (ideally ½-inch) sections of your hair. This is because larger sections aren’t going to relax evenly, leaving you with a non-uniform look. Use a comb to part and separate (careful not to irritate or harm your scalp). Always use a timer. Do not just start texting your best friend and realize you’ve passed your time by five or ten minutes. Even if you want a super-straight look, just follow the directions to minimize risk. We recommend doing it every 8-10 weeks, but of course, that’s entirely up to you and your preferences. Maintaining a regular relaxing system makes sure your hair is uniform and doesn’t cause unnecessary stress to your line of demarcation. If you do it too much, you’re going to end up hurting your hair by overlapping chemicals. Go too long, and you may see more shedding and breakage than the norm. While we enjoyed every hair relaxer on here, we did find that one stood out to us more than the others. That product was the Hawaiian Silky. The no-lye formula works well on thinner hair, but can also be used on coarse hair. The Hawaiian Silky Relaxer contains avocado, tea tree oil, and various other vitamins and nutrients, it works to keep your hair strong, healthy, and looking its best. It’s great for those with sensitive skin and delicate hair, which is great, as many thin-haired women are nervous that their new product is going to cause serious damage. If you weren’t a fan of the Hawaiian Silky, no worries! All these hair relaxers are great products, and we’re sure that whichever best hair relaxer you choose, will be perfect for you!